In fact, there was no “hunt.” The lion was lured from the sanctuary. Palmer then shot and wounded him with a bow and arrow. But the lion that he and his local guides hunted down and killed wasn’t just any big cat, according to Zimbabwean officials. 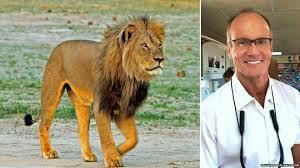 Cecil was a beloved resident of Hwange National Park and a major tourist draw for Zimbabwe. The 13-year-old black mane lion suffered a slow and painful death, lasting about 40 hours, according to the Zimbabwe Conservation Task Force. This is at least the third and latest incident in which Palmer has broken or bent laws to kill wildlife, not for food but for sport and recreation.